The Georgia Flu explodes over the surface of the earth like a neutron bomb. News reports put the mortality rate at over 99%. A band of actors and musicians, called the Travelling Symphony, move through the territories of a changed world, performing concerts and Shakespeare at the settlements that have formed. Twenty years after the pandemic, life feels relatively safe. But now a new danger looms, and it threatens the world every hopeful survivor has tried to rebuild. Moving backward and forward in time, from the glittering years just before the collapse to the strange and altered world that exists twenty years after, Station Eleven charts the unexpected twists of fate that connect six people: celebrated actor Arthur Leander; Jeevan, a bystander warned about the flu just in time; Arthur's first wife, Miranda; Arthur's oldest friend, Clark; Kirsten, an actress with the Travelling Symphony; and the mysterious and self-proclaimed "prophet." 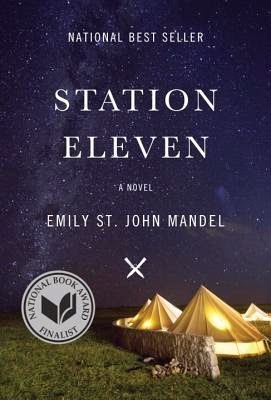 Sometimes terrifying, sometimes tender, Station Eleven tells a story about the fragility of life, the relationships that sustain us, and the beauty of the world as we know it. The world has ended. The cause? The Georgia Flu. The epidemic wipes out hundreds of people on Day 1, and that's just in Toronto. With the setting of the story being in my home city, Toronto, I couldn't help but be drawn in. As I continued to read on, I found Station Eleven to be a gripping tale about a post apocalyptic world. It was very character driven and showed that even after civilization has ended, humanity will find a way to honour past inventions and preserve our literary past. This book has been the recipient of various awards since it was published last year and in my opinion, each one was well deserved. I thoroughly enjoyed Mandel's spin on the end of the world because her focus is not on survival, it's on what happens after you've achieved it. Station Eleven is a captivating and thought provoking book that I would highly recommend to all. This is the first book I've read by Emily St. John Mandel and has easily become a new favourite of mine. I'll definitely be looking out for some of her past books to add to my TBR. If you have any suggestions, please leave me a note in the comments. For more information about Station Eleven by Emily St. John Mandel, click here. To learn more about +HarperCollinsCanada visit their Facebook page or follow them on Twitter @HarperCollinsCa.